Lenauheim was founded in 1767. It is one of many settlements that emerged under the reign of Maria Theresa in what was called the “second Swabian move” or “Theresan settlement”. The settlements were under the administration of Wilhelm von Hildebrandt. On the same spot, the medieval village of Csatád was probably erased in a late-medieval Ottoman attack. The ‘new’ Csatád built by Hildebrandt saw an impressive development in the 18th century and became seat of the county in 1775. 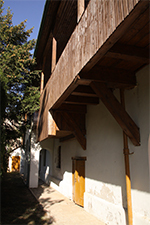 In the same year, the “Kameral house” was built, an administrative building, which is nowadays used as a museum for local history and folklore of Banat Swabians. The village of Csatád was the centre of a large region of agricultural importance until 1779. After that, an administrative reform dissolved the county of Csatád and new counties were formed. In 1799, Franz Niembsch Elder of Strehlenau, an inspector of the administration, and his wife came to Csatád and had a son on August 13th 1802: Nikolaus Franz Niembsch Elder of Strehlenau, who called himself Nikolaus Lenau after 1820. Under this name, he has entered literary history. His works are inspired by Lord Byron and Giacomo Leopardi. 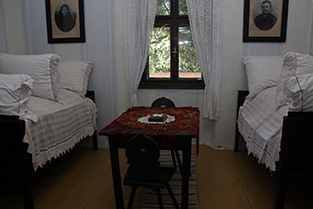 On the first floor of the “Kameral house”, a museum commemorating Lenau and local history can be found. Apart from an impressive collection of folklore dolls from 50 different Banat Swabian villages, items of everyday life, furniture and old photographs can be seen. 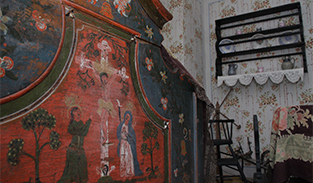 Some rooms are decorated in the traditional style of Banat Swabian farmhouses. 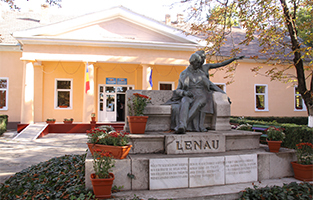 The museum’s part about Lenau exhibits books, quotes and copies of documents and thus gives a good overview over the poet’s life and work. Lenau memorial in front of Lenau’s town hall. Interior of a Banat Swabian bedroom. Banat Swabian living room with house altar. The soup terrine reminds of a forgotten profession: the porcelain mender. Most of them were poor travelling craftsmen who offered to mend broken porcelain for those, who could not afford to buy a new one. 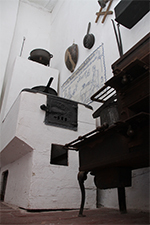 The museum has a focus on local folklore history. In all of the rooms, traditional handmade wall coverings can be seen. They were made after pre-printed patterns, which were sold on fairs and later could also be bought in drapery shops. The mottos or blessings on them are a reflection of the Christian-moral education. In Banat, bilingual, sometimes even trilingual wall coverings can be found: German-Hungarian-Romanian. Also, some coverings look alike and are merely translated into different languages, such as Serbian, Ukrainian or Croatian.